ADDC, the creators of the world’s first x86 credit card-sized pluggable computer, the BioDigitalPC®, have successfully tested and launched their newly patented Mobyl Data Center (MDC22) to both military and commercial markets. “The successful launch and testing of the MDC22 proves that our vision to create the world's smallest mobile data center has been achieved,” explained ADDC chairman and CEO Michael Arnouse. ADDC, makers of the world's first x86 credit card-sized pluggable computer, the BioDigitalPC®, announced today that they have successfully designed, built, tested, released, and been granted a utility patent for a suitcase-size mobile data center, aptly named the Mobyl Data Center. 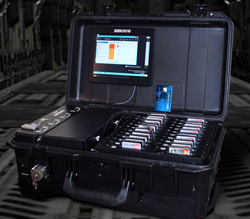 The MDC22 holds twenty-two x86 servers housed in a rugged case the size of an average carry-on bag, weighing less than 50 lbs. The goal of the Mobyl Data Center and BioDigitalPC® ecosystem is to create a new, x86 pluggable computing platform that reduces the footprint of energy consumption and e-waste and provides government and commercial markets with a true alternative to traditional obsolete computing platforms. Prior to creating the Mobyl Data Center, ADDC invented a rugged, credit card-sized x86 pluggable computing card called the BioDigitalPC®, named for its eco-friendliness. While inventing the BioDigitalPC®, ADDC realized that this form factor could revolutionize the size requirements for just about any environment requiring x86 computing or a server cluster. BioDigitalPC® contains a credit card-sized x86 computer with up to 8GB of memory and a 128GB hard drive. The Mobyl Data Center platform can scale up to 22 quad-core credit card-sized BioDigitalPCs®, 88 x86 cores, 176 GB DDR3, and up to 32TB of SSD storage (optional). MDC22 is purpose-built for the military but works well for state and local governments and large enterprise environments. The BioDigitalPC® ecosystem has card readers for development, an embedded card version, and all of the schematics needed to build new and exciting systems. The BioDigitalPC® and MDC22 can be used in the harshest conditions.